Note: The park opens at 8:00a.m. 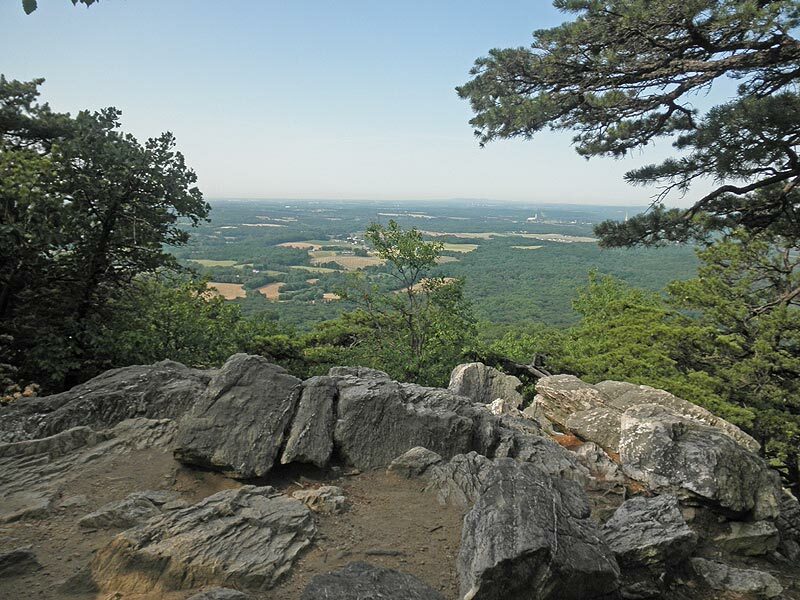 Sugarloaf Mountain is the prominence visible in the piedmont as it rises out of the plains southeast of Frederick MD. 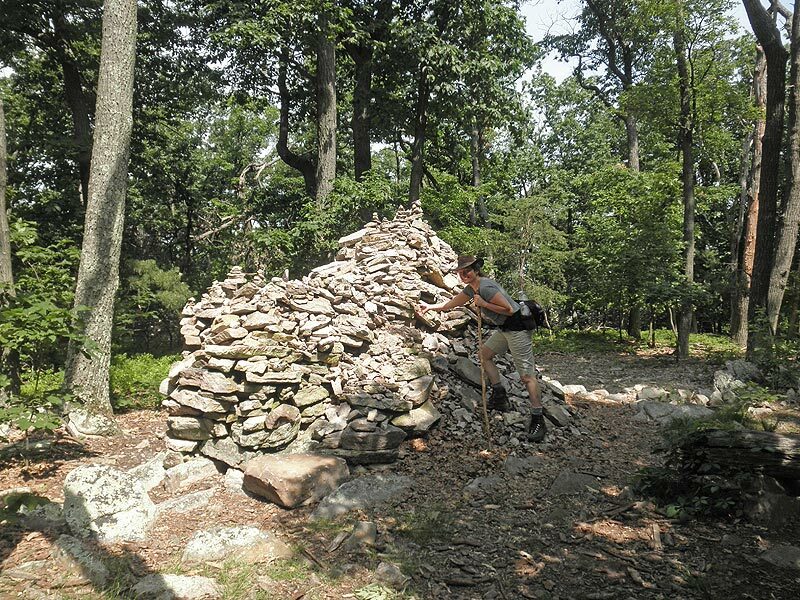 The mountain and trails are maintained by Stronghold, Inc. a non-profit setup by Louise and Gordon Strong in 1946 to preserve the mountain so it could be enjoyed by everyone. 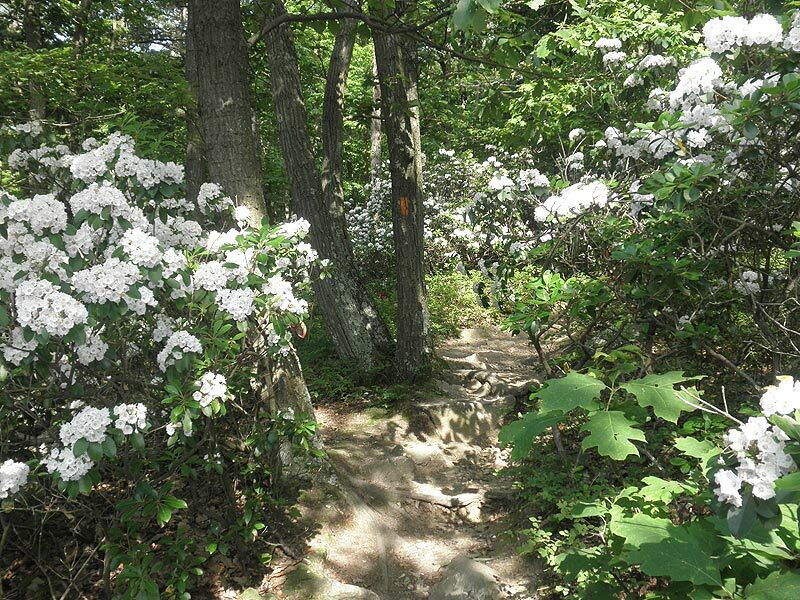 The mountain has many wonderful hiking trails that can be combined to create many different loops. 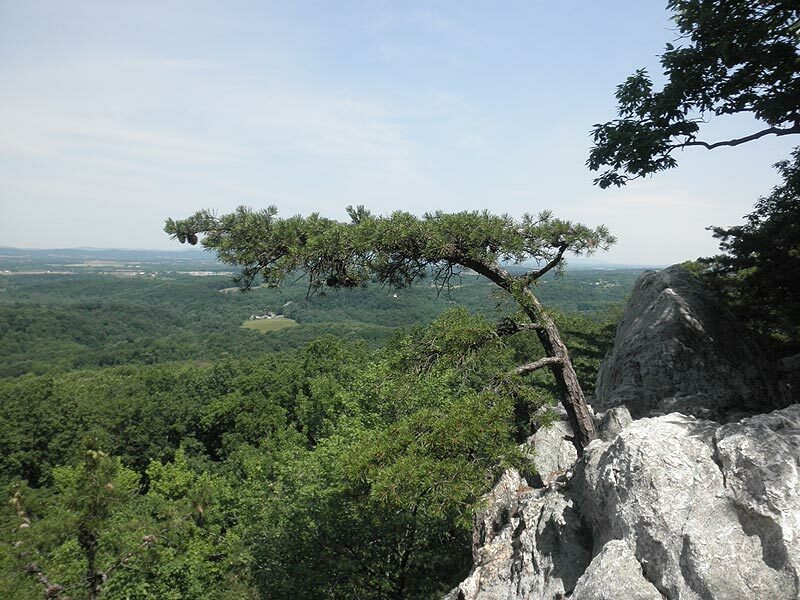 The hike we have here is a 6.8 mile variation of the blue Northern Peak Trail loop. From the East View parking area, start the hike up the orange blazed trail as it steeply ascends the mountain for 0.3 miles and ends at the red blazed trail (if you don't want to make the hike up the steep orange blazed trail, park a the West View parking area and take the green trail to the summit, where it turns in to the red trail). At the red trail intersection at the end of the orange trail turn left for 100 yards to the summit of Sugarloaf Mountain, and views to the south. Return down the red trail, passing the orange trail you ascended, for 0.3 miles where it ends at the intersection of the blue Northern Peak Trail and McCormack Overlook. From this point turn right and follow the blue trail. 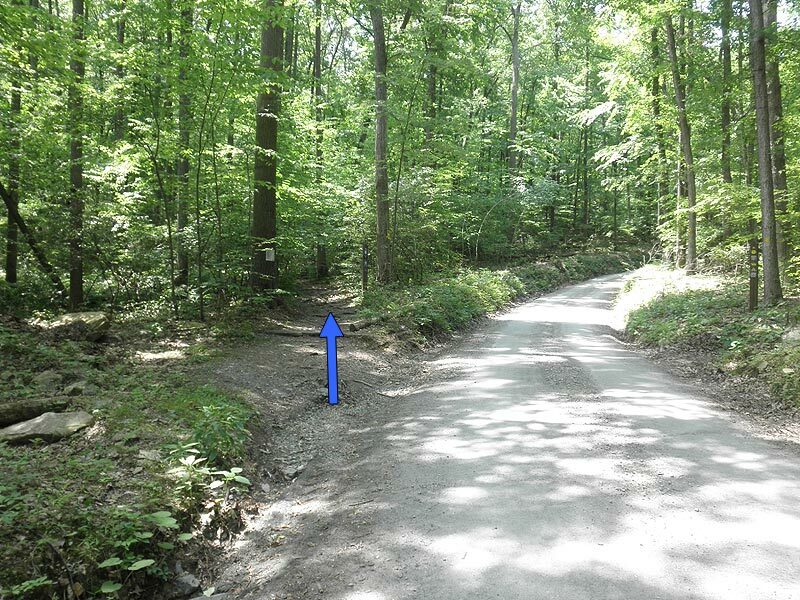 The blue trail will meet the white blazed trail in 0.1 mile where it turns left and becomes the blue/white trail. In 0.1 miles the white trail turns left, and the blue right. Turn right continuing to follow the blue blazed trail. The Stronghold, Inc. trail map is also marked with location signage. The marker on the blue trail will be 'B2', use these to help navigate the loop. The next intersection will be with the yellow and purple trails. Remain on the blue trail towards White Rocks. 1.2 miles from this intersection arrive at White Rocks. There are 2 overlooks here. 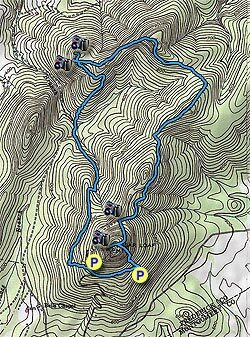 Continue on the blue blazed loop as it descends the mountain and turns left on a mountain road in another 0.8 miles, then makes a quick right, and turns off the road to the left back into the forest. 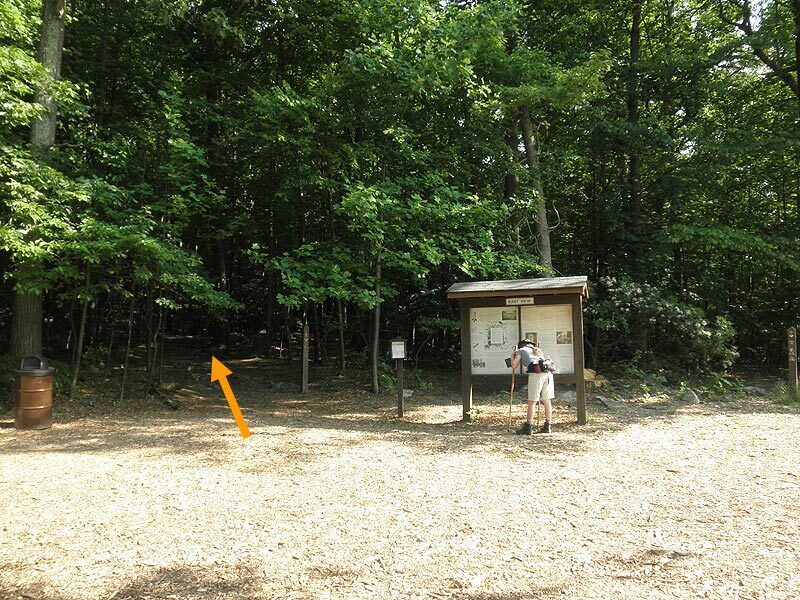 The blue trail will now climb for 0.9 miles to the junction of the white loop trail. Turn right on the blue/white trail for 0.4 mile at which point the white trail splits off to the right. 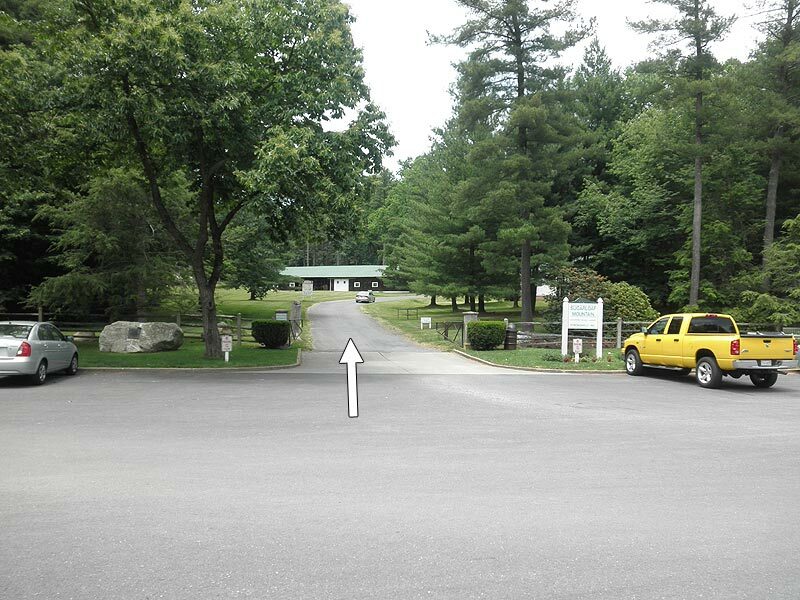 Remain straight uphill for another 150 yards to the West View parking area. 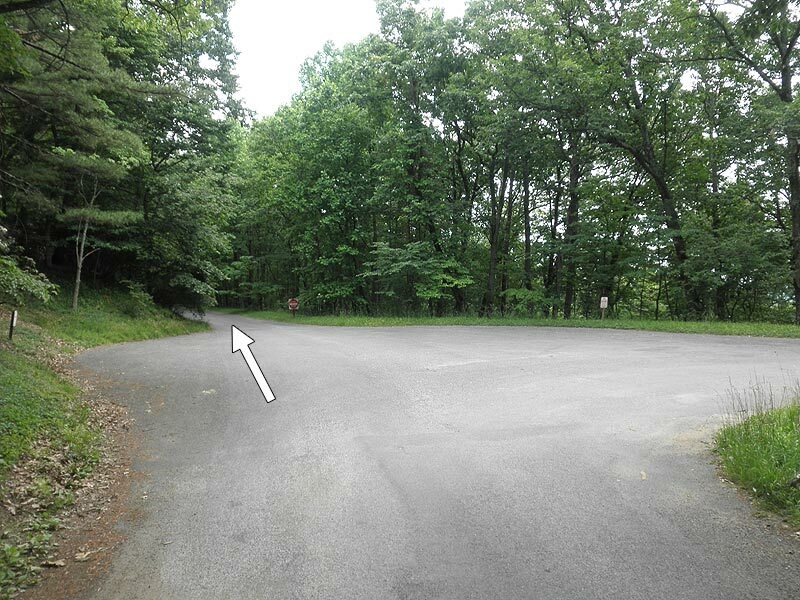 From this point hike down the road for 150 yards and at the hairpin turn remain straight on the one-way section. Follow the road the remaining 0.3 miles to the hike start point and East View parking area. This was our first hike of the fall, so we took it slowly. 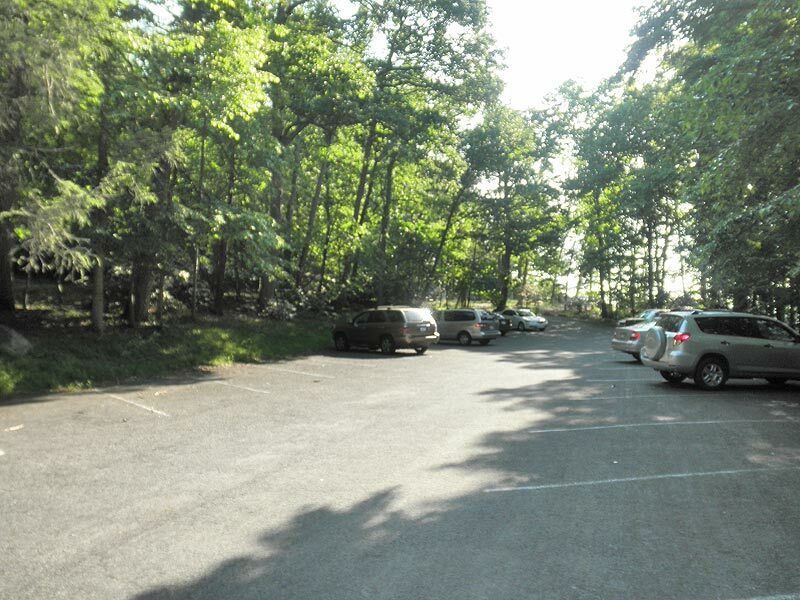 We started on the white trail in the East View parking lot until it merged with the Blue trail. We then stayed on the blue trail as described in the trail listing. It was a great day to hike, weather-wise. We started about 1130 in bright sunshine and finished just as the rain started. The trail map lists the Blue trail as 5 miles, but with starting at East View parking on the White trail made the loop 6.2 miles (according to my GPS). Beautiful day for a hike, especially for late July in this area. Did the Blue trail all the way around, ascended the peak on the Red trail and came down the Orange trail. One especially rare thing to occur is there was a timber rattlesnake hanging around the White Rocks overlook. These are extremely rare to find in Montgomery County. He wasn't bothering anyone, but of all places for him to be, the overlook (where a lot of people go to get great views of Frederick County) was not the best place for him to be. Be aware of venomous snakes when hiking! Solid hike. Got started on the trail at about 9:45, and it was mostly quiet (probably because its winter). The absolute hardest part of the entire hike is the first 10 minutes, up from East view parking. After that, there is no scramble, nothing too steep. So if you make it up the yellow hill, you're fine - also worth mentioning, the way down on the West View isnt anything like the way up on East view. Trail started to get more crowded later in the day, and the views are amazing, but the trail is well maintained and marked. So I am on a hiking spree- every weekend, I plan to do one tough and one easy hike. 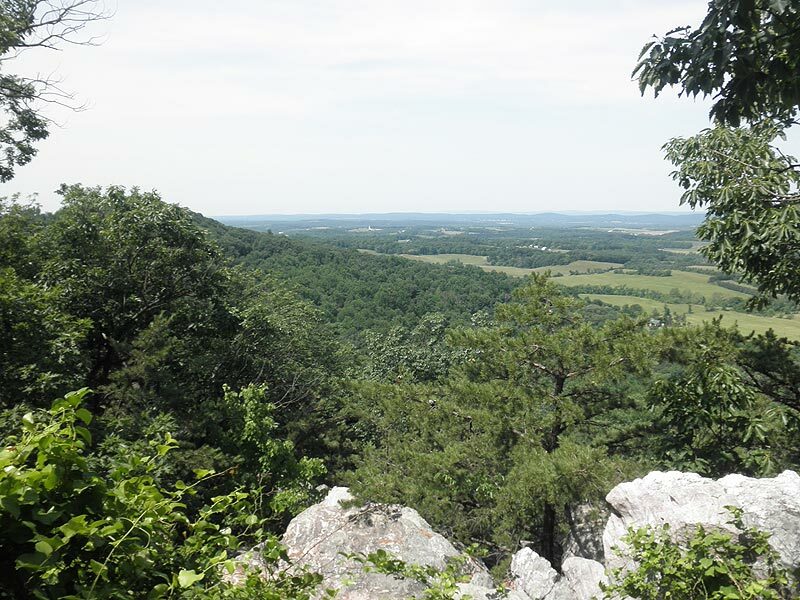 Sugarloaf was my easy one (although Signal Knob wasn't tough either), but through and through the hike was amazing. I parked in the east lot and started my hike at around 10 am. I have to say the initial ascent is really good- I absolutely enjoyed the steep and rocky climb! But it wasn't worth much (besides burning calories) as I went to the summit first- the morning was still drizzly/misty, so didn't get any views there. However I followed the blue blazed trail and the terrain was a good mix of ascents and descents but not tough at all. 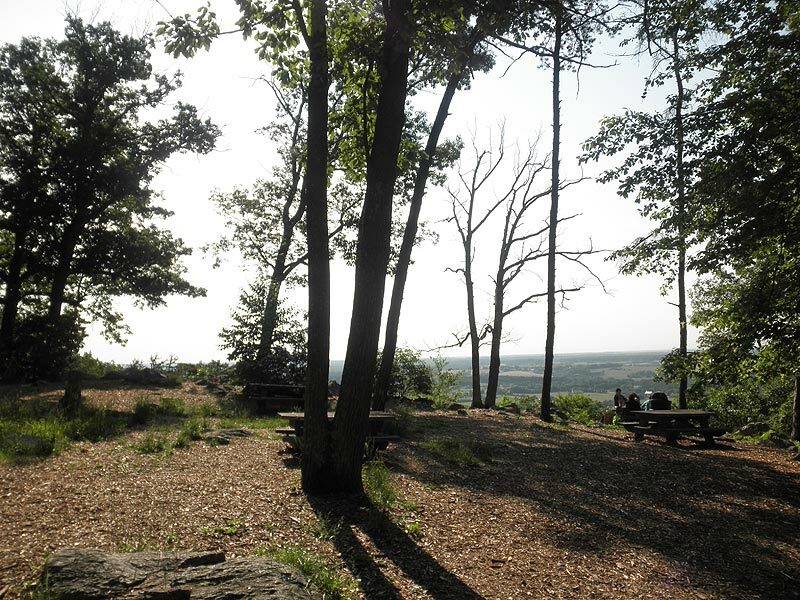 I've been to Sugarloaf Mountain many times and had hiked most of this route. This time I did the official Hiking Upward version from start to finish. For some reason I have usually started from the west parking lot on the mountain, except for one time from the base parking near the offices. This was my first time approaching the summit from the east parking lot. Unlike the west side, this route to the top was part rock scramble. The orange blazes are faint but can be seen on the rock. The blue route was pleasant as usual. Most of the trail is not too rocky for me. Just saw two other hikers with dogs, unleashed in violation of park regulations. A surprising amount of litter at the start -- I cleaned up a bit. It had been rainy but the trail was in good shape, with just one muddy spot I had to work to get around. I was the only one in the east parking lot upon arriving at 8:30 am. There were seven cars when I returned. Looks like they're adding some parking -- I see land grading and tree cutting near the parking areas.